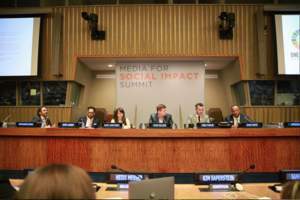 NEW YORK, NY--(Marketwired - Jun 16, 2016) - PVBLIC Foundation and the United Nations Office for Partnerships hosted the third annual Media for Social Impact Summit on June 1st at the United Nations Headquarters in New York City. This year's summit united nearly 250 top media & advertising executives to foster intelligent conversation about the power of media to address the world's most pressing social and developmental issues. The Summit highlighted the most engaging and collaborative campaigns in the social impact space. Some of the featured campaigns included: a sneak peek of UNICEF's 'Imagine' song, the 'Angry Birds Happy Planet' Campaign launched at the International Day of Happiness by Sony Music Entertainment, Department of Public Information and the UN Foundation. 'Love Has No Labels' by the Ad Council and 'Youth 4 Global Goals' presented by AIESEC to name a few. "The goal of the summit is to aggregate the power of a room full of media executives and influencers to help change the conversation, using media for social impact. We today use media and advertising to influence people and everything they do; from what they buy to what they wear to where they shop -- media influences all of our decisions. With this power of influence, we have created some of the world's greatest brands. We believe that this power of influence could also be utilized to connect people at a level of consciousness that engages them to affect change, to do good and care about building a better tomorrow, today," explains Sergio Fernandez de Cordova, Co-Founder and Chairman of PVBLIC. The Media for Social Impact Summit aims to inspire and activate media executives around social good campaigns to help solve global issues and raise awareness around the Sustainable Development Goals. An example of activating and developing partnerships was started a year ago, at the last summit. A collaborative 15-year strategy, a partnership between PVBLIC Foundation and its partners Mekanism, Creative Science Labs and Exit 10, called #OneforAll was soft launched at the Summit. By presenting the current efforts of the #OneforAll team, PVBLIC called on other participants to pick their #OneforAll and further that by making commitments and get involved in this long term strategic vision, which aims to be the activation platform to engage and inspire people to act. Therefore, getting them educated and engaged in the Sustainable Development Goals agenda, raising awareness and understanding and committing to them one at a time. "In September 2015, all member states came together and adopted the new Sustainable Development Goals, and what is very important now is that as many people as possible know about the goals and what it actually means. It's all about changing the world and that is why it is so important that all of you are here today, because we really need your help," says Ms. Ann de la Roche, Officer-in-Charge and Chief of Operations, UNOP. "You are here today because you are the powerful individuals that care about our world. You have already proven your immense talents in various industries and now you have the chance to transcend this room and help us make history by amplifying the message of the 2030 Agenda for Sustainable Development and make sure that is heard by everyone," states David Nabarro, Special Adviser on 2030 Agenda for Sustainable Development to the United Nations Secretary - General. Award-winning journalist Nadira Hira hosted the daylong event, which engaged media specialists and UN delegates in a series of panel and roundtable discussions, keynotes, and interviews, directed toward attaining the 17 Sustainable Development Goals. Speakers included Geena Rocero, Founder of Gender Proud; Christie Marchese, Founder of Picture Motion, Mauricio Sabogal, Global CEO of Kinetic Worldwide; Jacki Kelley, COO of Bloomberg Media; Terre Blair, Executive Producer of Big Problems. Big Thinkers. Film; Jesse Robinson, Founder of Tyler Robinson Foundation and Peter Koechley Co-CEO of Upworthy. The main partner of the Summit was Conversant Media Group, the mobile app partner was Eventmobi and the cocktail reception was made possible by FAIR Spirits. Other supporters included: Soapwalla, Deep River Snacks, Go Raw, EL VOYAGE, Kameda, and Green2o. To learn more about the Summit and to stay up to date with the initiative please visit: http://www.mediaforsocialimpact.org/. PVBLIC Foundation is an innovative non-profit media agency that harnesses the power of media to drive social change. An aggregator of media across all platforms, PVBLIC works strategically to pair media space with key non-profits at the local, national and global levels. We utilize existing and emerging technologies to increase issue awareness around important causes and help non-profits amplify their message. At PVBLIC, we believe that media is the new currency.